Home » Austria » How to Get More Points in Austria Point Calculator? Planning to immigrate to Austria? Want to know about Austria red white red card point calculator? Here’s what you need to know Austria points based visa. Immigration to Austria is an ideal route for skilled professionals wishing to work overseas. Austria is a promising land where you can thrive and flourish. The country offers exciting opportunities for highly qualified professionals and there will be a place for every skilled professional. Immigration to Austria brings you close to amazing opportunities where you can leverage your skills and abilities. In order to Austria immigration, you need to qualify under Austria Red-White-Red Card scheme. Austria Red-White-Red Card scheme is outlined for skilled professionals who wish to live and work abroad. It follows a point based system and candidates who apply under the scheme are required to pass a point test. In order to get an Austria red white red card, applicants are required to score adequate points for various attributes. Austria points based visa is a service for your initial orientation only. The Austrian Public Employment Service will assess the Austria Red-White-Red Card applications and documents that are filed as per the required criteria and will award points under Austria points based scheme. In order to take up a test, you need to be either a very highly qualified worker or skilled worker in shortage occupations or graduate of Austrian universities and colleges of higher education or self-employed key worker. For all the categories, you need to attain adequate score to qualify under the system. All the above mentioned categories have different attributes under which you can acquire maximum points. 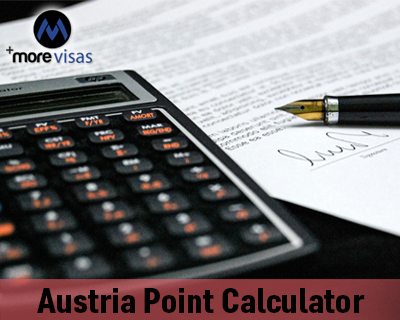 For example, if you are a highly skilled professional, you need to acquire 70 points under Austria points based visa. Points will be awarded for Special qualifications and skills, Work experience, Language skills, Age and education in Austria. If you are interested, then right away you can take the test to know your eligibility towards Austria immigration. And also you can fill our enquiry form. ← Know Different Types of Australia Temporary Visas before you Apply!